Dozens of Israeli soldiers invaded, on Monday at dawn, the home of a Palestinian who, just a day earlier, carried a stabbing attack in Gush Etzion illegal colony, south of Bethlehem in the occupied West Bank, and took measurements of the property in preparation for demolishing it, Maan News Agency has reported. Maan stated that the soldiers surrounded and invaded Yatta town, south of Hebron, before storming the family home of Khalil Yousef al-Jabarin, 17, and ransacking the property, causing excessive damage. 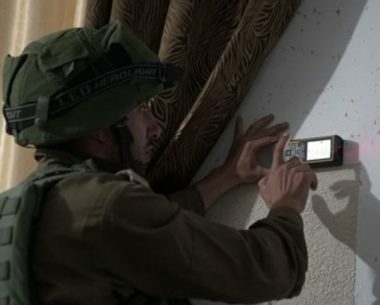 The soldiers, from the Combat Engineering Corps, took measurements of the property to prepare for demolishing it, as part of Israel’s illegal collective punishment policies targeting families of Palestinians who carried out, or are accused of carrying out attacks, against Israelis. It is worth mentioning that Jabarin was shot after he reportedly stabbed an armed Israeli colonialist settler who is also a U.S. citizen, identified as Ari Fuld, 40, inflicting a serious injury, before he later died from his wounds, at an Israeli hospital in occupied Jerusalem. The Palestinian was shot and injured by Fuld, before the soldiers detained him; he is currently in a moderate condition at an Israeli hospital.